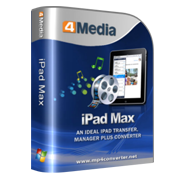 Well designed for Apple iPad tablet fans, 4Media iPad Max provides the perfect solution to backup iPad files to PC or iTunes and transfer PC movies and songs to iPad without using iTunes. As an iPad music/video converter, the iPad management application can also convert CD/DVD, various videos/audios, ISO images and IFO folder to iPad supported video and audio formats. The input video and audio files include M2TS, MTS, AVI, MP4, MPEG-4, MPEG, WMV, DAT, TS, MPV, NSV, M4V, MOV, QT, H.261, H.264, MP3, AAC, WMA, AAC, AIF, AIFF, AC3. 4Media iPad Max has high compatibility with all iPad models and other Apple portable devices including iPad, iPad 2, iPad 3, iPad 4, iPad mini, iPad mini 2, iPad mini 3, iPad mini 4, iPad Air, iPad Air 2, iPad Pro, iPod, nano (5th Gen), iPod mini, iPod shuffle, iPod classic, iPod touch, iPod touch 4, iPod touch 5, iPod touch 6, iPhone, iPhone 3G, iPhone 3GS, iPhone 4, CDMA iPhone 4, iPhone 5, iPhone 5S, iPhone 5C, iPhone 6, iPhone 6 Plus, iPhone 6S, iPhone 6S Plus. With featured editing tools, the iPad manager allows you to edit track information, preview Home DVD movies/videos/audios, quickly find you files, take snapshots, and so on. Easy iPad management: backup movies and music on PC to iPad and transfer iPad movies, music and images to PC. Import iPad movies and music to iTunes library using 4Media iPad Max. Fully support iTunes 10. This iPad manager can Convert CD/DVD movies to iPad and convert ISO images/IFO folder to iPad videos or audios. 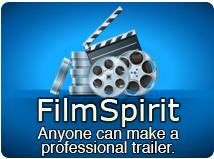 Convert local videos and audios to iPad supported formats. The input videos/audios include M2TS, MTS, AVI, MP4, MPEG-4, MPEG, WMV, DAT, TS, MPV, NSV, M4V, MOV, QT, H.261, H.264, MP3, AAC, WMA, AAC, AIF, AIFF, AC3. Completely supports iPad 2, iPad Wi-Fi, iPad Wi-Fi+3G, iPad 16GB, iPad 32GB and iPad 64GB, and even other Apple portable devices including iPod touch, iPhone, iPhone 3G, iPhone 3GS, iPhone 4. Allows you to customize soundtrack information, such as name, artist, album, composer, and year. Quickly search the key words you entered and find out files according to album, artist and genre. Create/delete/rename photo albums to manage iPad photos conveniently. And it is possible to import one photo into multiple albums without any limitation. This iPad management software will automatically recognize your iPad once connecting iPad to your computer and show its info including capacity, model, format, and serial number. The embedded player is also a stand-alone player which lets you preview DVD movies, videos and audios with adjustable aspect ratio: 4:3 or 16:9. Click "Snapshot" button to capture your lovely movie images and save the captured images as JPG, PNG or BMP files. This iPad transfer supports several interface languages: English, German, French, Simplified Chinese, Traditional Chinese and Japanese.